So this week my husband has been talking to me about one of the students in his class. (Let's just call her Jane)...Jane has a problem with cutting. Her home life is messed up. Her mother is gone and dating all kinds of the wrong people. And her father isn't any help to her self-esteem, makes her feel less of person w/ his words--constantly cutting her down. So I met her on Sunday. Sweet Beautiful "Jane" --- When my husband was telling me about her on saturday i told him to point her out to me.... My heart went out. Just last night he gave me the rest of the story...there is a group of about 3-4 girls in his class that all hang out together... One other girl who attempted suicide and Jane who self-mutilates. As my husband told me their story and what he sees in school everyday.... My eyes filled with tears...but I feel so unable---- I never experienced anything like this as a teen. I only heard of it and it was far from me. I don't know how to reach out to these girls. It is SO prevalent today... So here's what I'm asking. I need information. I need YOU to help me---enable me, even if it's just for this small group of girls. I would encourage you to get to know the girl or girls casually. Don't tell them your husband told you exactly what happened to them or whats going on in their life. Perhaps if you need an opener you could say that he said she could use a friend and that you could to. Then invite her for coffee or art or something and encourage her to relax with you, while trying to make her feel special and liked. If you manage to befriend her and she confides in you, you could suggest books that help with self growth and positivity if shes a reader. 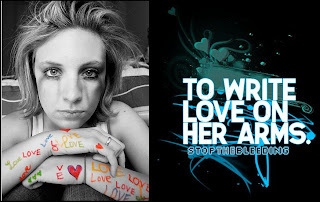 Or encourage her to put her feelings down on paper in writing or art. If you think that she wouldn't be completely unreceptive you could try and encourage her to go to counscelling. If none of this is possible you could always try and make friends with her father and be supportive to him and possibly make her life more tolerable that way. I agree with some of Trianna's suggestions. I think art/graffiti and/or an art journal is the way to go once these girls will talk to you. Things is, they may find it harder to relate to you (particularly Jane), if their own moms have let them down. That could be why they see your DH as a bit of a hero... You can only smile and be open to them. I don't have experience in this field personally either, but I have a teenage DD who has 'troubled' friends, so it's just a matter of being there and listening if, and when, they want to talk. Good luck! My teen daughter introduced me to this organization/group TWLOHA. She wanted to buy one of their tee-shirts and make a donation to the group. She was very touched by what they are trying to do. She is very tenderhearted to others she sees suffering even tho she does not come from such a background. We do get quite a mix of kids (and adults) coming to our home. My advice would be to just chat with Jane. When you see her at your husband's work, comment on something she is wearing. "Cool earrings!" "Interesting tattoo." "I like your color tee-shirt." Something simple and sincere. (Kids can soooo tell if you are not sincere!) See if it leads to a few minutes of chatting. As she comes to trust you, you can invite her over like Trianna said for art. Keep it simple. Since you mentioned that your husband did work as a youth pastor at a former job, I hope you will have more than just self esteem to teach her. God created her! God loves her - no matter what! And as you reach out to her you can be sharing that love too! Blessings. email me if you like.